Tough environments demand the most of the deployed encoders and call for optimum protection - not only during operation but already when being installed, for example to provide motor or generator feedback in wind power stations or in applications in the paper and metal industry. Besides proven hollow shaft designs, the user focus is more and more on enhanced connection flexibility to always be on the safe side, even under tough ambient conditions that are hostile to technology. The all-encompassing Baumer encoder portfolio meets also these demands by the robust HOG-86 encoder family with multiple connection options for eased and straightforward installation in harsh environments. 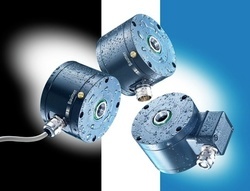 The hollow shaft encoders with IP66 protection endure ambient temperatures from +100°C down to -40°C, provide certified ex-protection compliant to II G/D 3 and optionally come with cable output, radial connector output or terminal box which is rotatable through 180°. Latter allows for the cable being conveniently attached elsewhere, and all what remains to do on site is to plug-in the terminal box in the desired position. The two-layer housing beneath the terminal cover ensures optimum protection even during installation. The torque support can be attached in ten different positions and adds another plus on mounting flexibility. Thanks to the generously dimensioned dual bearings the encoder is unaffected by shocks and vibrations and withstands axial shaft loads up to 200 N respectively radial loads up to 300 N.
The high-quality output signals ensure dependable evaluation even in control stations which are 500 m away. Electrical insulation of the bearings will prevent balls and surface from damage by shaft currents. The encoder is optionally also available with electrically insulated long-life hybrid bearings which will further enhance the anyway extended service life by a double. Besides, there are optional monitoring functionalities such as EMS („Enhanced Monitoring System“) based on a rapid microprocessor for consistent monitoring of the encoder functionality across the entire speed range. Upon diagnosing an error or malfunction, the encoder will visualize an alarm and output a warning signal. The redundant HOG 86 M comes with EMS monitoring functionality in its standard configuration. The encoder ensures two-channel relative position and speed feedback which is a frequently demanded prerequisite in plant error diagnostics.